Of all the railways in London, I only recently became aware of a special railway and today took a trip along what is London’s only Funicular railway. A Funicular Railway is a special railway that is designed to run up very steep slopes – such as cliffs or mountains. 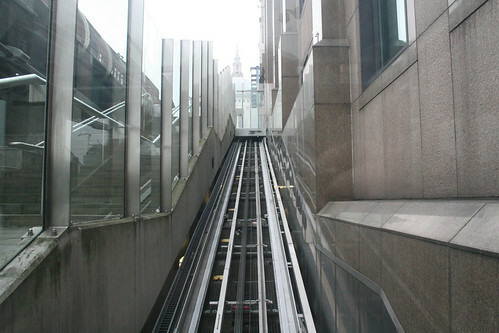 London is not exactly well known for its mountainous terrain though, but nonetheless it does have space for a small funicular railway – and right in the heart of the City no less. Thanks to a tip-off from Tom, Tired of London, I found out that this rather unique railway was installed as part of the millennium (aka, wobbly) bridge to help people get down to the riverside path if they are unable to use the stairs. Although I pass across the bridge quite a few times, it had never really occurred to me that an accessibility issue even existed as the bridge itself is entirely step-free, but evidently the builders decided the stairs next to it required some sort of mechanical option. 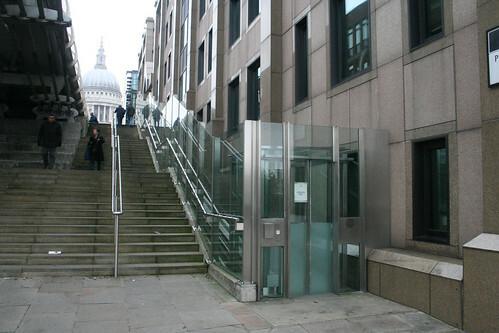 A lift would be the normal way of solving the problem, but here the lift would either need a long deep alley at the ground, or a much wider path at the top – so they came up with a sloping railway that also matches the slope of the stairs. 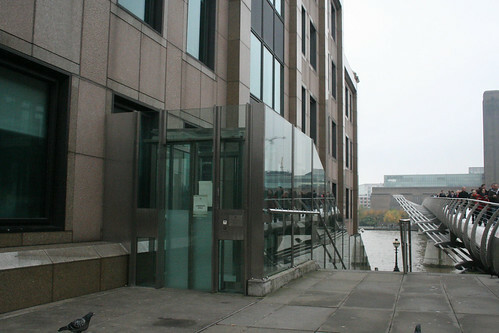 Frankly, as far as railways are concerned, this one is quite pathetic – and although some might argue that it is just an inclined elevator, it is formally classed as a funicular railway, and the only one in London. Therefore I simply had to take a trip along it – for all of about 60 seconds. Approaching the shiny steel and glass box at the top of the railway, you can’t help but notice the rather disfiguring warning sign that the carriage is limited to four people at a time. It has a habit of breaking down rather a lot, presumably due to being overloaded – but the signs could have been printed on something a bit more appropriate. The train carriage was already at the top when I arrived, and once inside, unlike a normal train, here you select which “floor” you want, more like a lift. A bit confusing as the “floors” are marked as Floor 1 and Floor 2. Guessing that Floor 1 is the lower level proved correct, but maybe up/down arrows would have been clearer? With a slight jerk, you are off on your trip along this very unique of London railways and a slow sedate trip takes you down the slope to the lower level. And that’s it – a one minute trip along London’s only funicular railway. Returning to the other end of the railway line by the more conventional means of the stairs, my antics and photography drew quizzical looks from a couple of bystanders. “It’s a funicular railway. Might not look like much, but it’s the only one in London” I explained. Indeed, it isn’t much, but it shares one very appealing aspect with the DLR – you can sit stand at the front in the “drivers seat”. That alone makes it worth the trip! More photos over at my usual place. Why is it “formally classed as a funicular” when the Wiki page you link to clearly states that funicular is 2 carriages joined by a cable. An inclined elevator certainly but I can’t see this being funicular in any way. It is about to be replaced it seems, perhaps for £750k. See the Evening Standard article here. For many years this was closed because it’s design was so new that nobody would insure it. My Mum’s in a wheelchair and so we had to try this out. On four times we have tried over several years, it was only working once. On that one trip we filmed the exciting journey. There was a busker playing violin outside, so the movie got its own soundtrack!